The Razer Raptor is the first gaming monitor ever released by the brand which is most famous for creating peripherals such as gaming mice and keyboards. The specs on the screen aren’t new, but Razer’s unique designs for their products like this one always brings something new to the table. The Razer Raptor and its advertised eye-popping performance is a bold step for the brand, but will it be worth its premium price? The Razer Raptor’s aesthetic and functional design is probably its most important aspect to various unique characteristics. The product is finished in the brand’s signature matte black treatment on both plastic and aluminum casings. The monitor is bezel-free, although there are 2.3mm thick panel borders which are negligible by today’s standards. The dimensions reveal a very sleek device, although the use of aluminum in the materials increased the weight drastically. The cabinet itself is only a few millimeters thin, eliminating VESA mounting options for the device. Razer modified the standard formula of gaming monitor design, resulting in a few pros and cons. But this modification is what makes the Razer Raptor exciting and fresh. The monitor doesn’t use the typical stand to VESA mount combination, but instead, it utilizes a sliding hinge mechanism. This design shaved off a few inches or pounds from the device, making it fit into Razer’s aesthetic formula. The bad news is the mechanism will only offer tilt and height adjustments judging from what we can see. You can’t swap it out for a VESA mount like most monitors, so buying the Razer Raptor means you have to live with this setup. But to be honest, we know Razer fans will not buy the Raptor just to stick it to a wall and leave the aluminum stand. It’s the Razer Raptor’s most significant selling points primarily due to the addition of Razer Chroma to the base. The CNC-milled upright also has an integrated cable management layout which will allow you to slip cables in parallel to each other. Most concepts only place a hole or clip to hold wires in place, so this is a huge plus for the monitor’s functionality. The Razer Raptor’s connectivity layout includes the latest standards such as DisplayPort 1.4 and HDMI 2.0 for video inputs. There are two USB 3.0 passthrough slots for your Razer peripherals, but what stands out is the USB-C interface on the product. This connector supports DP 1.4 Alt mode while providing charging power for devices such as the Razer Blade or Razer Phone. The Razer Raptor sports a 27-inch IPS panel with a 2560 x 1440 resolution, 144Hz refresh rate, and 4ms response time. A contrast ratio of 1000:1 is listed, along with a 420cd/m2 backlight that’s bright enough for most situations. This model is specified to be capable of HDR, but the latter two specifications limit it to DisplayHDR 400 standards. QHD at 144Hz is the current sweet spot for gaming and is rapidly becoming the universal standard for enthusiasts. Pricing and availability have considerably improved in the past year, so more and more gamers are adopting 1440p screens for their builds. Power users even prefer 2K 144Hz over 4K 60Hz since it is smoother and sharp enough for everyday use. However, the firm says that the Razer Raptor is capable of 95% DCI-P3 for added range and vibrancy. Most IPS modules struggle to reach this level, but there are newer and better technologies such as LG’s Nano IPS which can fulfill the spec. Despite the limitations of the other characteristics, the screen should still be able to produce extreme vibrancy with decent to superb accuracy. The Razer Raptor is a FreeSync-based display which will allow AMD GPU users to enjoy buttery smooth gaming. Nvidia has recently announced support for non-G-Sync monitors with their latest cards and drivers, so there is a high possibility you can still enjoy adaptive sync with this gaming monitor. Razer is marketing the Raptor as an E-Sports-ready display, so input lag and motion handling should be nothing short of impressive when it finally arrives. 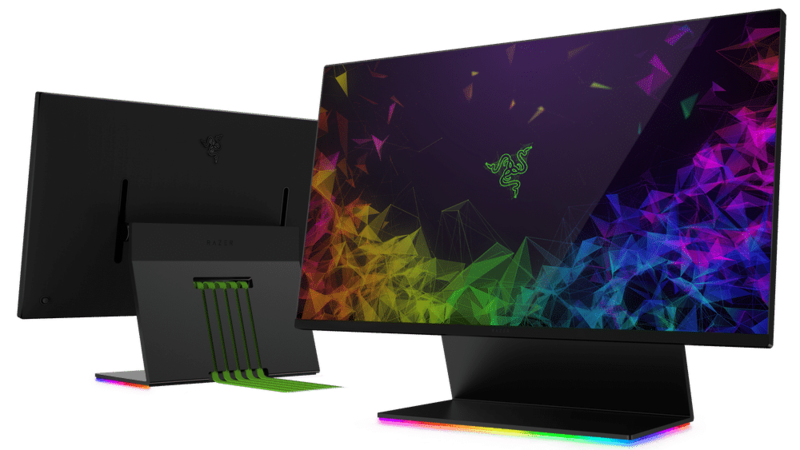 The Razer Raptor is an impressive piece of kit from the premium peripherals brand who took the extra mile in redefining the PC display form. The radical aluminum base with Razer Chroma is our favorite characteristic of the product, but of course, the performance must be equally brilliant. The modernized approach such as the addition of USB-C is an excellent direction for gaming monitors in our books. The Razer Raptor is still in its prototypical stages so that we might see some changes in the following months. No specific date was released, although SRP is pegged at around the $700 mark. For the latest information regarding this exciting display, keep checking this article or visit Razer’s official page for the Raptor.